British archaeologists have unearthed an amphitheatre at a ancient port outside Rome which may have played host to emperors such as Hadrian and Trajan. The team, led by the University of Southampton, say the arena could have held up to 2,000 people and been used for gladiator games or animal baiting. It was found inside a gigantic imperial-style palace within the well-preserved old harbour of Portus. Experts said the entire site deserved greater recognition. 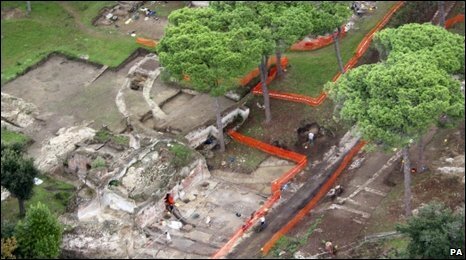 The excavation team, which also included archaeologists from Cambridge University, has spent two years at Portus, about 20 miles (32km) from the Italian capital. They worked in collaboration with the British School at Rome on the first large-scale dig at Portus. The ancient gateway to the Mediterranean Sea, which is twice the size of the port of Southampton, supplied the centre of the Roman Empire with food, slaves, wild animals and building materials for hundreds of years. It is now two miles inland and next to Fiumicino Airport's runway. The project concentrated on the banks of a hexagonal-shaped man-made lake which formed part of the 2nd Century harbour. This area was first excavated in the 1860s and what might have been a theatre was discovered and marked on plans, but no trace of the building could subsequently be found. The British team has now discovered an oval-shaped theatre - similar in size to the Pantheon in Rome. Professor Simon Keay, director of the Portus Project, said the theatre was tucked away at the eastern end of the palace. "Its design, using luxurious materials and substantial colonnades, suggests it was used by a high status official, possibly even the emperor himself, and the activities that took place there were strictly private," he said. "It could have been games or gladiatorial combat, wild beast baiting or the staging of mock sea battles but we really do not know. "What we do know is it's unusual to find this type of building with elements of imperial architecture so close to a harbour." In addition to the amphitheatre and 295ft (90m) canal, the archaeologists have made thousands of smaller finds. The project aims to answer a number of questions about the development of Portus and its relationship to the nearby but better known Ostia, the ancient port of Rome built on the banks of the River Tiber. "It's going to generate a lot of rethinking about how ports were used and that will change the way we think about Rome's relationship with the Mediterranean," said Prof Keay. "The site has been known about since the 16th century but it has never been given the importance it deserves. It has been grossly understudied." He claims it is "one of the most important archaeological sites in the world" and should be rated alongside "such wonders as "Stonehenge and Angkor Wat in Cambodia".